Fallen Forte in a sweet collaboration style with Thunder Trucks for the Fall ’11 line. The upper is heavy-duty canvas with a waxed coating for a bit more shred life. Vulcanized camo sole, and a faux suede Thomas label on the lightly padded tongue. Check out that stylish Thunder grenade heart! I feel like these shoes have my name on them, I’ve only skated Thunders, except my first board which had Trackers. And they’re Vegan! 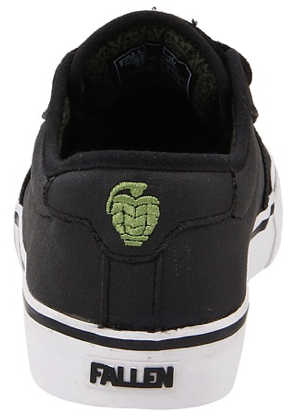 Represent the skate scene and get them from Skate Park of Tampa, they have free shipping on this shoe. But if you wear a tiny size, big-foot, or you don’t want to rep Thunder then Zappos has a couple other Vegan Styles.